Posted on Tue, Feb 8, 2011 : 6:02 a.m. 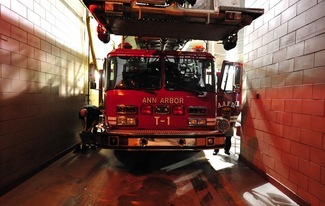 The Ann Arbor City Council approved a $54,000 contract Monday night to examine staffing levels in the Ann Arbor Fire Department. The contract vote was among several council actions, including the approval of a design contract for a new roundabout at Fuller Road and East Medical Center Drive and approval of new downtown design guidelines and a capital improvements plan. The city is calling on the International City/County Management Association to assemble a team of experts to complete "an analysis of current and future deployment of staff and resources" in the fire department according to a memo from the administrator's office. The memo states the ICMA study will determine the appropriateness of current staffing levels in context with calls for service, response times and employee safety standards. The city of Ann Arbor is taking a closer look at staffing levels in the Ann Arbor Fire Department. "An objective analysis of the call center data and overall operation assessment will be developed," the memo states. "The deployment benchmarks will be reviewed and compared to national standards such as the 2010 National Fire Protection 1710 and 1720 standards, as well as the recently proposed amendments to the Insurance Standards Office (ISO) Public Protection Classifications." The goal of the analysis, according to the memo, is to develop recommendations for Ann Arbor that will "enable the city to produce the outcomes necessary to provide critical emergency services" and "provide the city with a thorough and unbiased solution to the questions regarding the usage of services." The fire department is on the chopping block as the city looks to confront a $2.4 million budget deficit for the next fiscal year. At a recent city budget retreat, top city officials discussed the option of adopting a paid on-call approach to fire services in Ann Arbor. The firefighters union maintains the fire department already is understaffed and does not meet national standards. Staffing levels in the department remained steady at 94 full-time employees for the last several years, until five positions were cut last year. Formal budget proposals for the police and fire departments are due next week. The City Council voted unanimously Monday night to adopt new downtown design guidelines, while appointing seven members to the city's new Design Review Board. From now on, new developments proposed in downtown Ann Arbor will be required to go through a mandatory review process to see how well they fit the city's vision. Compliance with the design guidelines will be voluntary, though. The board is expected to meet as needed and provide a report back to council within one year regarding the effectiveness of the new guidelines and design review process. Council members voted to approve a new six-year Capital Improvements Plan that will serve as the basis for the city's capital budget for the next fiscal year. The plan identifies major public construction projects and improvements. Included in the plan is $26.8 million for the first phase of the Fuller Road Station project next year, along with $13.4 million for the project in the following year. Another $1.1 million is included next year for reconstruction of Fuller Road from Fuller Court to Huron Parkway. The City Council ultimately will decide whether those items are going to be included in the city's budget later this spring. The University of Michigan is expected to help pay for the majority of the costs for the first phase of the Fuller Road Station project. The station is eventually expected to be an intermodal transit facility with accommodations for trains, bicycles, buses and pedestrians. The first phase is a 977-space parking structure with five built-in bus bays and 103 bicycle parking spaces. Nearly $1.7 million was included in the Capital Improvements Plan to pay for an extension of the Ann Arbor Municipal Airport runway, but that request drew some debate at Monday's meeting. As they did last year, council members voted to remove the project from the plan. The vote was 6-5 with Mayor John Hieftje and Council Members Stephen Kunselman, Mike Anglin, Sabra Briere, Carsten Hohnke and Christopher Taylor in favor of removing the project. Council members approved a $460,139 contract with DLZ Michigan Inc. for the design of a new roundabout at the Fuller Road/Maiden Lane/East Medical Center Drive intersection. Homayoon Pirooz, head of the city's project management unit, said the intersection currently works poorly and is anticipated to further deteriorate with continued development in the area resulting in greater traffic demands. The intersection lies along one the city's primary access routes to and from downtown and also serves as an important junction between the University of Michigan's central, medical and north campuses, and the city's Lowertown/Wall Street district, city officials said. In addition, the proposed Fuller Road Station will be located adjacent to the intersection and will serve as an essential transportation hub within Ann Arbor, city officials said. Council members received a copy of the city's investment portfolio report for the fourth quarter of 2010. At quarter's end, the amortized cost value of the portfolio was $200.8 million. If investments were recorded using the fair value method, the value would be $202.5 million. Recording investments at fair market value, the portfolio experienced an unrealized gain of $1.7 million. Thu, Feb 10, 2011 : 3:09 p.m. Wed, Feb 9, 2011 : 4:40 p.m. I read with intrest your article on the City council looking into a part-time fire department for Ann Arbor. I could'nt believe what I was reading. With city streets already clogged with traffic and UofM students, do you really think its a good idea to have twenty or more part-time firefighters racing to the scene of a building fire in their private automobiles? am I the only one who see's a problem with this concept. If the firefighters are only spending 10% of their time with fire related activities, why not have them transport your city's medical calls to the hospital? This could raise more than a million dollars for the cash strapped city. If ever I saw a city that has need for a professionally trained fire department its Ann Arbor. GO BLUE! Wed, Feb 9, 2011 : 2:12 p.m.
From Billings, MT: <a href="http://billingsgazette.com/news/local/article_1eb6661a-a290-11df-917d-001cc4c03286.html" rel='nofollow'>http://billingsgazette.com/news/local/article_1eb6661a-a290-11df-917d-001cc4c03286.html</a> &quot;From the City Brew just off King Avenue, only a window and a short distance separate the business from the roundabout at Olympic Boulevard. Between serving lattes and cappuccinos, barista Jessica Hagemeister, too, has witnessed a few fender-benders and wrong-way drivers. "A good portion of the people don't seem to know how to properly use them," she said. "I think they're a good idea, but I don't feel safe in them." But when it comes to public safety, both Fire Chief Paul Dextras and St. John say the roundabouts were designed to accommodate emergency vehicles. They advise drivers, however, to exit the roundabout before pulling over to let emergency vehicles pass. "The worst thing for someone to do is to panic and stop," St. John said.&quot; Any search online will turn up dozens of &quot;people don't know how to use them&quot; comments, whether they're sprouting up all over or not. Better do your research, traffic engineers. This may not be optimal in the area of a hospital. Wed, Feb 9, 2011 : 1:41 p.m. Wed, Feb 9, 2011 : 12:49 a.m. PLEASE, no more roundabouts. Thank goodness the ones in existence are easy to avoid. Gordon Gaston said it well. Roundabouts do not belong where pedestrians need to cross. I certainly would not want to be half-way across the roundabout in my wheelchair when an ambulance heading to the hospital with its lights flashing and siren sounding appears. I cannot even imagine how a pedestrian who is not a sprinter can compete with traffic in a roundabout. Even though the walk lights at intersections do not stay on &quot;walk&quot; long enough for me to get across, at least I have a chance. Without the lights, forget it. Tue, Feb 8, 2011 : 10:36 p.m. I believe there will be safety and size complications with a roundabout in that area. Looking at other large volume roundabouts, the footprint of the roundabout needs to be large, as it needs to support a large volume of cars, as well as buses (from the transit center). From my best guess, the inscribed circle diameter (the road) needs to be 165 to 220 feet and the entire footprint (sidewalks, bike path, other stuff) will have a diameter of 240-300 feet). Tue, Feb 8, 2011 : 10:43 p.m.
&quot;In addition, the proposed Fuller Road Station will be located adjacent to the intersection and will serve as an essential transportation hub within Ann Arbor, city officials said.&quot; Did I miss something? So, the city decided that the station will be built? That's news to me. I thought that wasn't a done deal? I don't mind the idea of a roundabout, but for the purposes of safety, I'm not convinced that the proposed roundabout is large enough for the volume and the type of traffic that will flow through the area. I'm also not convinced that there is enough room in the area to build such a large roundabout. Tue, Feb 8, 2011 : 10:40 p.m. According to table 2 on the link above, that means that the inscribed diameter should be about 165 to 220 feet. The proposed diameter is 160 feet, which falls lower than the safety recommendation? <a href="http://a2gov.legistar.com/View.ashx?M=F&ID=1135229&GUID=F6F935FC-F3B9-4161-9128-897B9C09E1B7" rel='nofollow'>http://a2gov.legistar.com/View.ashx?M=F&amp;ID=1135229&amp;GUID=F6F935FC-F3B9-4161-9128-897B9C09E1B7</a> But even if the diameter was set to 165 feet, then would it fall on the low end of the safety recommendations? Complicating matters, there are 3 bridges, a park, the Huron River and a railroad nearby. So a large footprint would cut close to the river, the railroad track, the park, and expensive modifications may be necessary on the bridges. Tue, Feb 8, 2011 : 10:37 p.m. According to city staff, there are at least 30,000 transit trips on that stretch. This is the number that was being used to support the fuller road transit station (the parking lot with the bus stop sign). <a href="http://www.annarbor.com/news/concerns-surround-fuller-road-transit-center-as-project-moves-to-ann-arbor-city-council-for-approval/">http://www.annarbor.com/news/concerns-surround-fuller-road-transit-center-as-project-moves-to-ann-arbor-city-council-for-approval/</a> Since there are at least 30000 trips and more to come, then one realizes that the roundabout will be a high volume, multi lane roundabout. (View Table 1 on this link at the US DoT FHWA Safety document on Roundabouts <a href="http://safety.fhwa.dot.gov/intersection/roundabouts/fhwasa10006/" rel='nofollow'>http://safety.fhwa.dot.gov/intersection/roundabouts/fhwasa10006/</a> Since a transit center will be built for buses (and it's supposedly not a parking lot), and it &quot;will serve as an essential transportation hub within Ann Arbor&quot;, then it is safe to assume that a large roundabout needs to be built that will accommodate buses, emergency vehicles and other large vehicles. Tue, Feb 8, 2011 : 6:55 p.m.
Could we get some roundabouts on Michigan Ave and US-23? That intersection is nightmare! Also, on Michigan Ave and Platt? It usually takes 5-6 lights to turn right onto Michigan Ave after 5 pm. Don't even get me started with the morning commute or anytime on Saturday or Sunday between 6 am and 12 am. Tue, Feb 8, 2011 : 6:47 p.m.
Tue, Feb 8, 2011 : 6:26 p.m.
Tue, Feb 8, 2011 : 6:07 p.m.
Tue, Feb 8, 2011 : 6:02 p.m.
Maybe congestion was worse before the roundabout at Geddes and US-23. BUT I drove to St Joe on US-23 Twice this morning and got off southbound 23 at Geddes both times. The 1st time was at about 7:30 and the 2nd time was at about 8:50. Both times traffic was backed up from the roundabout to the right lane of 23 southbound. IF this is progress somebody needs to go back to the drawing board! Tue, Feb 8, 2011 : 5:35 p.m. In regard to the proposed Fuller Road roundabout. This intersection has a large number of pedertrian crossings, 24 hours a day, to and from the Medical Center Campus. Many of the housing units across the river are occupied by hospital employees. It is also a part of the Border-to-Border Trail linking the county through the parks along the river. This location brings with it a special necessity to insure the safety of the differently abled, handicapped, and infirm, at this gateway to the medical center. The need for pedestrian access and safety must be clearly addressed in any intersection changes proposed at this location. Tue, Feb 8, 2011 : 5:20 p.m.
Just more bread and circus. Typical though, throw money at pet projects while the city infrastructure crumbles. It's already clear AAFD is understaffed. Sorry Mr. Mayor, trying to compare Ann Arbor to Troy is comparing apples to oranges. This &quot;objective&quot; study will only tell Fraser more of what he wants to hear. As for the roundabout at Fuller Rd. and Maiden Lane, all one has to do is look at the accidents and near misses at the Nixon Rd. Huron Parkway and extrapolate with increased traffic volume. I drive through the Nixon/H.P. roundabout daily and I'm shocked at the number of people who have no clue as to the rules of the road. I'd rather they spend $450K on Stadium Blvd before it falls in on someone's head, or on Jackson road before I leave half of my front suspension in a pothole. Tue, Feb 8, 2011 : 4:19 p.m.
Tue, Feb 8, 2011 : 4:48 p.m. The city received a bunch of state and federal grant funds to reconstruct the Stadium bridges once the ground thaws, possibly as soon as next month. Tue, Feb 8, 2011 : 3:09 p.m.
&quot;By spending the $460 K now the city will leverage over $2 million from feds&quot; Some talk about &quot;the feds&quot; like it is some entity on another planet! WE are the feds! Wake up America! Tue, Feb 8, 2011 : 2:59 p.m. The much needed roundabout at fuller has been in the city plan for years, long before the fuller rd. station (a great idea!) was conceived. This is the fastest growing employment area in the region with all the expansion at the hospital. There are over 25,000 people going to the hosp. complex every day plus all the N. campus and medical research traffic. If you look into it you see all of the roundabouts in this region have been paid for by the federal govt. out of the &quot;congestion mitigation fund.&quot; A local govt. does need to pay for the plans to get the funding. Roundabouts are sprouting up nationally, Michigan is still behind. They have proven over many, many years to be safer for drivers and pedestrians, they reduce congestion, save gas and result in cleaner air. Not a penny of the streets millage $$ could be spent on paying for firefighters. This has come up so many times it seems like some posters here just ignore the facts. Just like the money for art, the city would be guilty of fraud if they took money from the streets fund and spent it on police or firefighters or human services because it was collected for another purpose. Adhering to strict accounting rules and transparent budgets should be applauded. By spending the $460 K now the city will leverage over $2 million from feds. Less congestion, less pollution, better traffic flow, more jobs and investment right in A2. A smart move. Tue, Feb 8, 2011 : 11:18 p.m. I don't mind the idea of a roundabout, but for the purposes of safety, I'm not convinced that the proposed roundabout is large enough for the volume and the type of traffic that will flow through the area. I'm also not convinced that there is enough room in the area to build such a large roundabout. Tue, Feb 8, 2011 : 3:01 p.m.
Tue, Feb 8, 2011 : 2:52 p.m.
Keep in mind that roundabouts are popping up everywhere. Places from the high traffic area of Brighton to the back roads of White Lake. Ann Arbor is NOT the only city/town with this type of thing. I highly doubt that all these &quot;outsiders&quot; coming into Ann Arbor will come up to a roundabout screaming in terror and driving like they have their eyes closed. Please have a little more faith in those &quot;outsiders&quot; who come to enjoy/visit/shop in our beautiful city. Tue, Feb 8, 2011 : 2:38 p.m.
Tue, Feb 8, 2011 : 2:16 p.m. They &quot;took action&quot; by wasting another half-mil, it sounds like. $50K for another &quot;expert study&quot;, and $450K to design a roundabout of questionable need to service a parking structure of yet more questionable need. Just another day at council. At least they didn't add a full-time city &quot;Kumbayah Coordinator&quot;. Not yet, anyway. Tue, Feb 8, 2011 : 1:44 p.m.
Have you ever noticed that when government has to solve an obvious problem with political ramifications they hire a consultant for thousands of taxpayer dollars who comes to the same conclusion? Spend $54,000 that we don't have to tell us we need changes in the way we provide firefighting services. No wonder people like to be politicians. No responsibility push the blame on the consultant. Dealing with the unions really complicates logic, because you usually can't do what makes sense and is obvious to most people. Tue, Feb 8, 2011 : 2:19 p.m. I never understood the logic that a city-township-school must pay high salaries to attract &amp; hire knowledgeable &amp; qualified employees with masters degrees or better so these same people can just call on a consultant firm to make recommendations and/or decisions. I could do that for half the salary. Tue, Feb 8, 2011 : 1:39 p.m. If we are 'educating' drivers on roundabouts we should include some discussion on the 'yield to pedestrians at non-signaled crosswalks'. It does not seem to apply to the crosswalks along Plymouth Road. Additionally, all the non-signaled crosswalks around town seem to have random signage and striping designs. Why not follow through on some of the previous improvements prior to throwing more money out for other improvements. Please correctly stripe and sign all the non-signaled crosswalks first. Tue, Feb 8, 2011 : 1:27 p.m. Drivers don't understand how to drive roundabouts now without &quot;education outreach.&quot; Add visitors and emergency vehicles. Right. Tue, Feb 8, 2011 : 12:58 p.m.
An &quot;objective&quot; survey from International City Management Association? This company does business with the city on so many other levels I can not see how this is objective. If they come back with a result that Fraser doesn't like are they in danger of losing all the other business they do with the city, such as managing all the city employees 401K's? This is just another attempt by Fraser to muddy the waters. I guarantee this survey will read exactly how Fraser wants it to. When the City is so broke that it can't even keep Firefighters Staffed why are they spending $500,000 on a roundabout? Is this really the time to do that? That intersection is just fine the way it is. Save the money and use it for ESSENTIAL services. Tue, Feb 8, 2011 : 12:36 p.m. It is crazy how many of Ann Arbor's citizens are afraid of progress and change. The world can't remain in the same condition (1968) forever, just breathe. A roundabout, when used by people who know how to use one, is a wonderful thing. I support this 100% and applaud the city of Ann Arbor for its forward thinking and proper development of a great little city. Tue, Feb 8, 2011 : 1:17 p.m.
A roundabout, when used by people who know how to use one, is a wonderful thing. The problem being, how does one teach people how to use a roundabout? I agree that a properly used roundabout is often a good solution for intersections. However, many people either continue to use them like a 4-way stop or race around the circle, defeating the idea of allowing others to smoothly blend into the flow of traffic. Tue, Feb 8, 2011 : 12:23 p.m. I love the roundabouts but I'm sure one at &quot;Fuller Road/Maiden Lane/East Medical Center&quot; will work out well. A lot of people from outside A2 go through there headed to the hospital. The volume of traffic may be too high for a roundabout in that area. Tue, Feb 8, 2011 : 6:49 p.m.
@a2miguy But if the volume of traffic gets too high it can back up INTO the circle and then the circle doesn't work. If cars exiting on to MCD back up into the circle then traffic cannot get from Maiden Lane to Fuller. Tue, Feb 8, 2011 : 3:17 p.m. The volume of traffic may be too high for a roundabout in that area. Umm... the primary purpose of a roundabout is to handle high-volume traffic and keep it moving. Tue, Feb 8, 2011 : 11:51 a.m.